Product #21477 | SKU 13041009 | 0.0 (no ratings yet) Thanks for your rating! The speaker has an 8" composite fiberglass woofer and a 1" soft dome tweeter to provide clear, natural audio reproduction with a wide frequency response. The woofer is white to add unique contrast to the black cabinet for a combination of a classic 70's look and modern style. 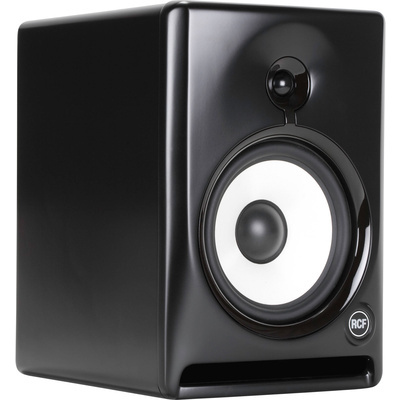 There is a slotted bass port on the front of the cabinet that helps to extend low frequency response while reducing distortion and turbulence. A precise directivity waveguide around the tweeter provides consistent coverage and a wide sweet spot. The speaker has a biamplified Class-AB design that provides 80W to the woofer and 30W to the tweeter to deliver a strong performance with low distortion. The rear panel offers XLR, 1/4", and RCA inputs for wide compatibility with a variety of professional and consumer audio systems and devices. Input sensitivity and HF trim controls let you customise the speaker's performance, and there is also a soft limiter to ensure smooth operation. The speaker also has a selectable 115/230V operating voltage for international use.